By default, Tsung use its own format (see FAQ What is the format of the stats file tsung.log?). Since version 1.4.2, you can configure Tsung to use a JSON format; however in this case, the tools tsung_stats.pl and tsung_plotter will not work with the JSON files. request Response time for each request. page Response time for each set of requests (a page is a group of request not separated by a thinktime). connect Duration of the connection establishment. size_rcv Size of responses in bytes. size_sent Size of requests in bytes. session Duration of a user’s session. 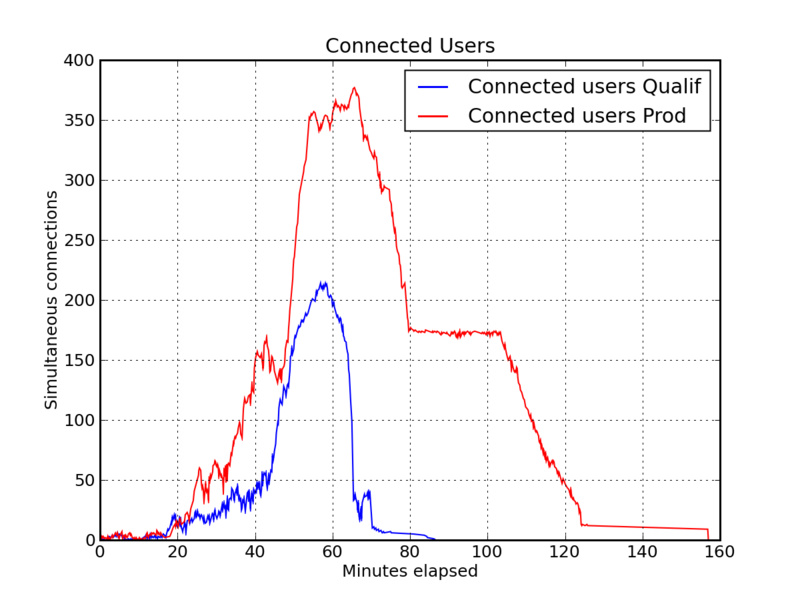 users Number of simultaneous users (it’s session has started, but not yet finished). connected number of users with an opened TCP/UDP connection (example: for HTTP, during a think time, the TCP connection can be closed by the server, and it won’t be reopened until the thinktime has expired). new in 1.2.2. The mean response time (for requests, page, etc.) is computed every 10 sec (and reset). That’s why you have the highest mean and lowest mean values in the Stats report. Since version 1.3.0, the mean for the whole test is also computed. request_noack Counter of no_ack requests. Since response time is meaningless with no_ack requests, we keep a separate stats for this. new in 1.2.2.
async_unknown_data_rcv Only if bidi is true for a session. Count the number of messages received from the server without doing anything. new in 1.2.2.
async_data_sent Only if bidi is true for a session. Count the number of messages sent to the server in response of a message received from the server. new in 1.2.2.
sample_counter when the input is a cumulative one (number of packet sent for ex.). counter: a simple counter, for HTTP status code for ex. sum for ex. the cumulative HTTP response’s size (it gives an estimated bandwidth usage). Since version 1.6.0, you can use the embedded web server started by the controller on port 8091. So for example if your controller is running on node0, use the URL http://node0:8091/ in your browser. 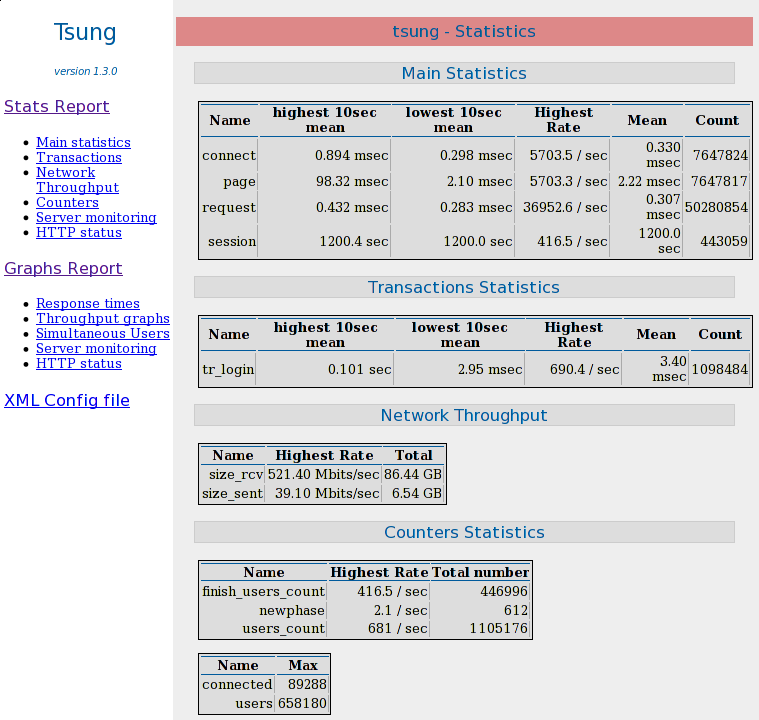 It will display the current status of Tsung (see Dashboard ) and generate on the fly the report and graphs. There’s also an option when you start Tsung to keep the controller alive, even when the test if finished, in order to use the embedded web server (see -k option). By default the web server will stop when the test is finished. You can generate the statistics even when the test is running! Version 1.4.0 adds a new graphical output based on http://dygraphs.com. Figure Report shows an example of a summary report. Figure Graphical output shows an example of a graphical report. Tsung-Plotter (tsplot} command) is an optional tool recently added in the Tsung distribution (it is written in Python), useful to compare different tests ran by Tsung. 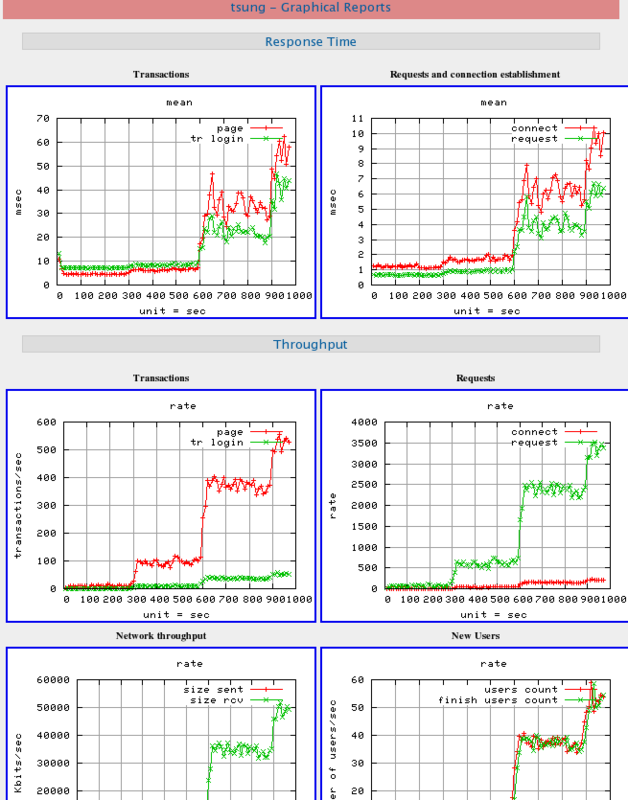 tsplot is able to plot data from several tsung.log files onto the same charts, for further comparisons and analyzes. You can easily customize the plots you want to generate by editing simple configuration files. You can get more information in the manual page of the tool (man tsplot). A contributed perl script tsung-rrd.pl is able to create rrd files from the Tsung log files. It’s available in /usr/lib/tsung/bin/tsung-rrd.pl.